For various reasons this weekend, I was thinking of my first triathlon. 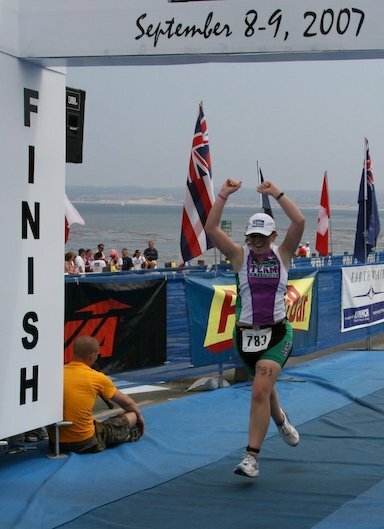 Finishing a triathlon was a long-time goal of mine, and in 2007 I achieved it. That was more than 11 years ago. Today my approach to fitness has changed (yay powerlifting! ), but my foundation built from that say in September has stayed with me. I finished that triathlon a couple years before my career transitioned into FOSS. There are some notable parallels between the two in my life as well. Training for a triathlon convinced me of my capability and reinforced my confidence in myself. So too did getting into the FOSS community. When I had doubts about my ability, there was a community of GSoC mentors and students that reassured me of their confidence in me. Every lap I swam in training, every stroke of my bike pedals, every step I took running in training for that triathlon also reassured me of my confidence in myself that I could complete that race. I also struggle with imposter syndrome and here too the triathlon was much like FOSS. I wasn’t sure of my skills of capability for running a community, but I succeeded. I was also never a great runner, but I succeeded in that race as well. How I feel about fitness has also changed along with how I feel about FOSS. They once were both challenging activities taking a lot of my time and attention to continually improve. Now they are parts of how I perceive myself and parts of the good I’m doing for myself and the world. I feel confident in my skills and abilities now while also acknowledging that I can continue to improve for the rest of my life. I will continue to endeavor to make my work and person lives a better reflection of myself, my values, and how I want to be in the world for the rest of my life. My first triathlon was a step along that path.